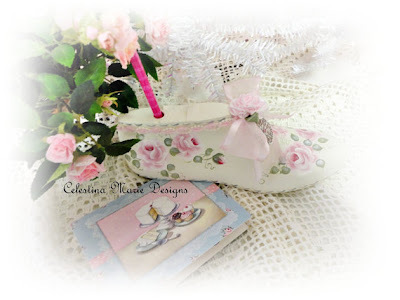 I just love vintage shoe molds! Many of you who follow my blog, know, my great grandfather designed shoes in Italy. When he came to this country with his large family, his wife, 4 girls and 2 boys, he carried many shoe molds to continue his work to support his crew. I am blessed to own several that my grandmother gave to me and I cherish them always for they represent the hard work and care my great grandfather sacrificed to support the ones he loved. Some of the molds he worked with are displayed in my home in their original form. I love seeing the knicks and dents, scratches and wear from years of use. I would never paint these from great grandpa, but I have painted and designed many. Small molds for Christmas tree ornaments and larger styles for desk accents holding pens and business cards. Even bookends work well with these old treasures. Today I am linking to The What-Not Party from Etsy Cottage Style. As you might also know, every Monday from Etsy Cottage Style we have a unique weekly party. Since this month has an extra Monday, this unusual topic is the feature. As it was explained, A what-not is a piece of furniture derived from the French étagère, which was exceedingly popular in England in the first three-quarters of the 19th century. It usually consists of slender uprights or pillars, supporting a series of shelves for holding china, ornaments, trifles, or what not, hence the allusive name. In its English form, although a convenient piece of drawing room furniture, it was rarely beautiful. The early mahogany examples are, however, sometimes graceful in their simplicity. So, this party will showcase What-Nots, be it a piece of furniture with a collection in it or just the collection itself. Thus, my What-Not is my collection of shoe molds that I display on a very high staircase ledge going to my second floor. Recently my dear friend Ann, from Ann's Finds, and I, were talking about the molds while shopping in one of our favorite antique markets, when we saw a "high heel" shoe mold sitting on the checkout desk for customers to use the pen and take a card. They are most unusual and hard to find today, but the one we saw was designed into a desk holder for pen and business cards. Of course we just loved it and I said how much I would love to find the high heel shoe mold sometime to create something special for a desk accessory. Anyway, long story short, Ann was at an estate sale and found not one, but two molds shaped in the high heel style. She got them both and brought them to me to style. Now the one we saw in the antique market, had a high heel glued on from a vintage high heel. So I began to shop the local thrift stores in search of a skinny high heel pair of shoes to design the two molds Ann found. I did come across a size 7 triple A slinky shoe with lots of bling and straps in black. I checked out the heel and could see this one could be taken apart to use and also I thought the bling from the shoe would be an extra bonus. Did you notice the shape of the mold? Very rare and hard to find these today. Molds like this can never stand on their own without a heel or pedestal. This pic is the shoe I found. Perfectly chic!! Now this is the best part. I brought the slinky shoes home and they fit the molds perfectly. I'm not kidding, I couldn't believe it. It was like the molds could have been used to design these shoes. 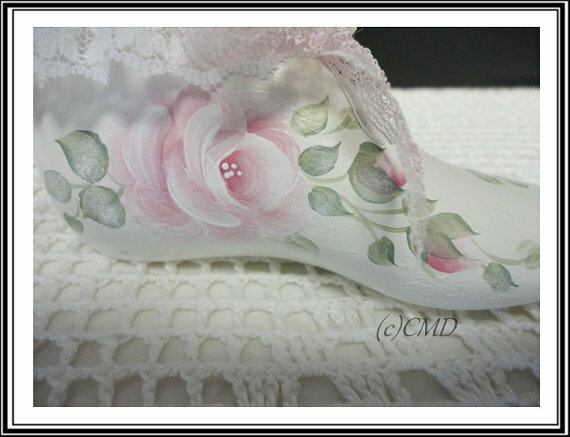 So I did not have to remove the heel, but could use the whole shoe as is and embellish it for the desk accessory we both wanted. This first one, I created for my desk using some extra gemstones, feathers and added my pen and business cards. This was so much fun and really looks great on the desk. My great grandpa would love it. I think, he may be the reason I love shoes so much. It's in the genes. LOL The following pics are a few more I've created and sold in my shoppe. Oh Celeste, I love, love the shoe forms dressed in the slinky black shoes and all the bling. Just wonderful! Thank you for your sweet comments on my blog. Celeste, what a wonderful biography on your family history! The shoe forms are nice and I love the shoes you made. They are gorgeous! How lovely to hear about your Grandfather and having some of the lasts, he used to make shoes with. I love the patina of the beautiful wood and as you say the knocks and dents only make them nicer. 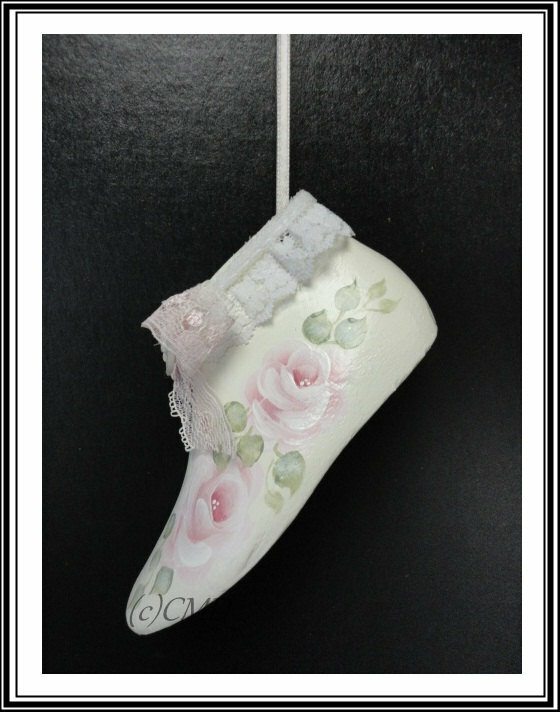 Also how beautiful the high heeled one you created for the work room and holding your business cards is. Your great grandfather was a very skilled man !! !Have a nice week my dear friend! What a charming piece of family history you own! A delightful post! I never paid much attention to the forms and I have seen them all my life throughout the country and, if I remember correctly, my grandfather kept them in his shoes in his closet...you just made me appreciate them much more! They are so pretty painted, too! 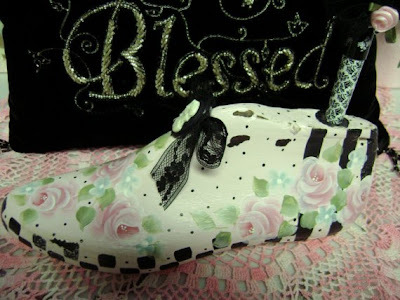 Of course your Grandfather would love your shoe mold creations...He probably helped lead Ann right to em that day...LOL Everything's beautiful as ever! How wonderful that you have so many family heirlooms to treasure. It makes one proud of their heritage. The wooden shoe forms brings back memories of my childhood. And love how you have put so much thought into decorating them. Very nice.! These are all as precious as your story of your Grandfather, he would be very proud of you if he saw this work. Just lovely! What a wonderful story of your grandfather and the shoe molds have such a charm to them! Oh that was so fun, I read every word and learned so much, I had no idea there was a high heeled shoe mold, the ones you recreated are darling, what a treasure to have your grandfathers mold! Nice collection with sweet memories. I have a shoe form that says "HAPPY" on it :) Fun. So wonderful Celestina! I absolutely adore the "shoes" you created for you and your friend - what a wonderful idea! The shoe molds that belonged to your Grandfather are a treasure indeed, and the nicks and scratches are a beautiful and hard-won patina. Wonderful! What a special thing to find something that your great grandpa used for making his living. You, more than anyone else, understand what is used for. Very fine craft one must say and very accurate. The person shaping these molds were artists too. Love to you and wishing you a happy May! Oh wow Celestina Marie! What a special story and how 'meant to be' your project is. God was working with you when he found this mold for you! What you've done with it is so pretty! How special that your great grandfather was making shoes in Italy! A lot of Dutch men go to Italy especially to have their shoes made there. They are of the finest quality. I was thinking.... about the molds of your great grandfather....... maybe when you'd put a plastic over a mold and make a mold of the mold with resin or rubber or clay you could reproduce them as a tributal item or something. Make something new with the old and making a touching connection with your great grandfather's work!? It's just an idea. I can imagine you'd never would want to paint them. I wouldn't do so either! Oh beautiful!!! I too love old shoe molds, but don't have any...yet! Hope you are doing well. IT's always a pleasure to visit you! Please visit me for a chance to win an Annie Sloan book! Fun post, Celeste! I don't think I've ever come across a high heel shoe mold! Just adorable and so YOU!! Meant to be for sure. I really love how you made one for Ann, too. Oh darlin' you are such a creative talent!!! Amazin' how that shoe fit the mold...it was meant to be! So adorable! 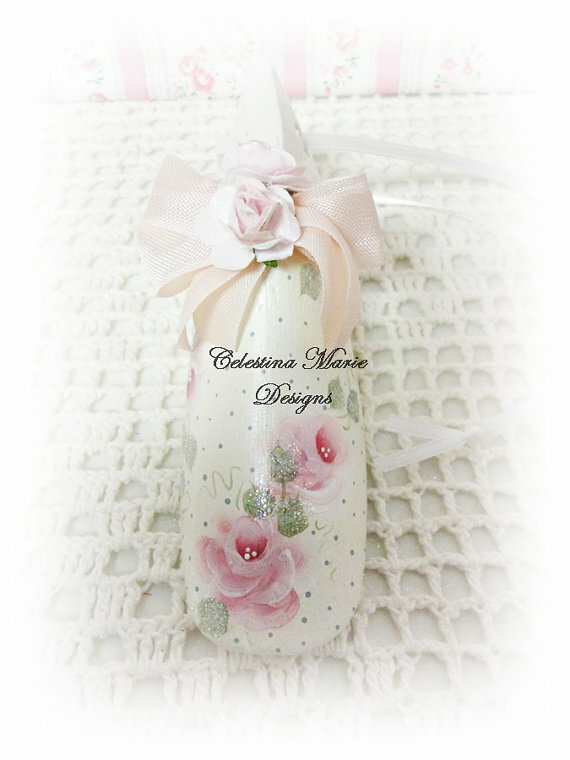 A sweet story and even sweeter items you have made! Loved this feature! How neat that it fit your shoe perfectly and I love the design you made of it. Plus the ones you painted are just beautiful! Thank you for your sweet comment. I always enjoy when ya visit dear heart!